1. In a small bowl, combine sour cream with 2 teaspoons Lawry's� Taco Spices and Seasonings from one package. Cover and refrigerate. Combine the remainng seasoning mix from the opened package with the refried beans and heat in a saucepan. Add water. (approximately 1/3 cup) to reach a spreadable consistency. 2. In a large skillet, brown ground beef until crumbly; drain fat. Add the second package of Taco Spices and Seasonings, water and mix thoroughly. Bring to a boil; reduce heat to low, cover and simmer 10 minutes. 3. Place tostada shells on a baking sheet in a single layer. Spread with 2 tablespoons bean mixture. Top with green onions and shredded cheese. 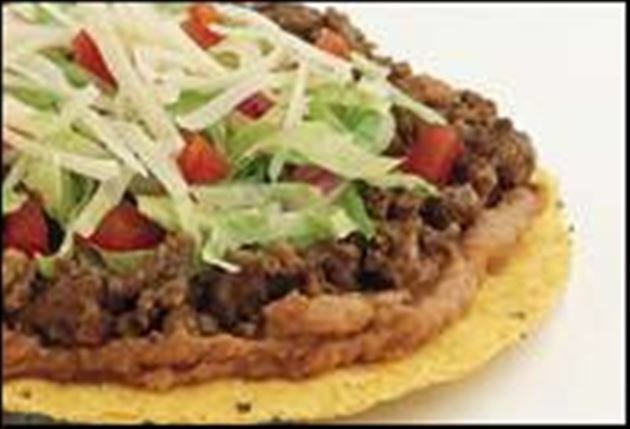 Place another tostada shell on top of cheese and spread with 2 tablespoons beef mixture. Repeat with green onions and cheese. Heat for 3-5 minutes or until cheese melts in an oven preheated to 375 degrees F.
4. Top each Tostada! Tostada! with a dollop of the taco seasoned sour cream. Garnish with diced avocado, chopped tomatoes or salsa, if desired. 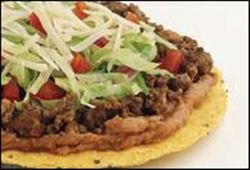 Enjoy this delicious tostada tostada Mexican recipe!